Ever heard of the art course called Drawing On The Right Side of The Brain? I had the great fortune to take it a few years ago. In it I learned that the left brain sees things presumptively, e.g. “oh I know what an eye looks like.” But the right brain sees shapes as they actually appear in front of it. So the trick in drawing is to turn the left brain off (turns out a great way to do that is turn things upside down), so the right brain can drive the process. Cool huh? SO HOW DOES THAT APPLY TO WRITING???? Here’s how it worked for me. I had put in many, many hours listing various attributes about my main and 3 primary characters. I knew how old they were (down to giving them birth dates), I could tell you what their favorite foods were, about their weaknesses and how they felt about the significant people in their lives. But somehow when I wrote about their feelings it still felt like I was using my “oh, I know how a girl reacts when a boy kisses her” mind rather than really seeing how these particular, unique people experienced things. It was a frustration that sneaked into my thoughts regularly. Well I guess The Muse felt sorry for me, because one day, OUT OF THE BLUE, while on a walk it occurred to me that because I am such a visual person (after all, I am a filmmaker), I needed to SEE these people, really live with them, to fully KNOW them. I rushed home and spent 2 days combing the net for images of key aspects of my characters’ lives, including photos of how I pictured them, the specific harmonica my protagonist plays, her favorite stuffed animal and even the neighborhoods I saw her living in. It was a revelation! 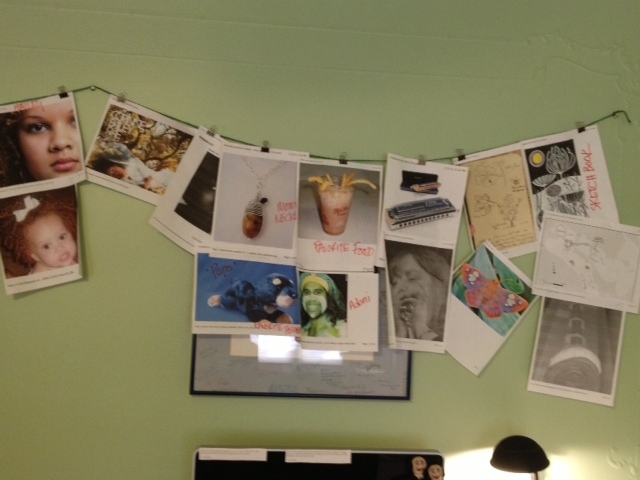 Especially when I strung the photocopies across the wall around my desk. So everyday, whether I am writing or not, they are with me. They are my friends now. And when I’m stuck, I don’t have to rely on my left brain to tell me about an archetype but I can look up and see them there, asking me to see them, REALLY SEE THEM. And I do. And I know my writing has grown as a result. And as Eleanor, and Twain, and Churchill and Osho (and so many others) have pointed out, the fear is not out there, but in here with me. So I’m showing up with the desire to create a safe place for ideas – mine, and yours. As of today’s posting, I am an unpublished author. But that doesn’t change the journey does it? Whether I am read by no one or 10 million people I still have to show up every day to I face the blank page, to face the rewrites, to face the ego-voice telling me that I am a loser. I still have to show up. I still have to turn away from the bad thoughts and look towards the light shining on the joy that I feel when I am writing. And I still have to show up and remind myself that life is not about arriving at the destination. It’s about taking the journey, enjoying each moment of the process; relishing in the criticism, jumping up-and-down with elation at receiving a personalized rejection letter, bathing in the waters of flexibility when I know full well that little change I am about to make could be the Jenga piece that will destroy the entire structure of my masterpiece. So my fear has turned to excitement that I will share the journey with you my fellow writers (and fans???). And look forward to growing together, into people who show up for what they love in their lives; who show up to be writers. May our dialogue inspire, stimulate, make you laugh – in recognition of what we have in common and what we don’t. I look forward to the exchange of ideas that begins today.